2016 Speak. Be Heard. Be Considered. The Dayton Human Relations Council is partnering with the Victoria Theatre Association and Dayton Public Schools to present the 2016 Speak. Be Heard. Be Considered. 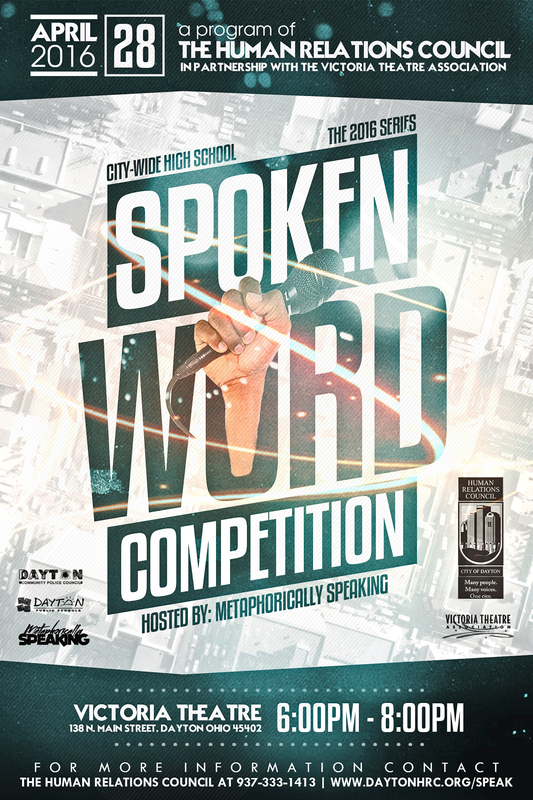 Spoken Word Grand Slam showcasing Dayton‑area high school students speak out against gun violence and its effects on lives and communities. 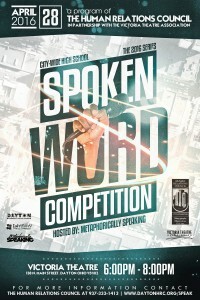 Hosted by Metaphorically Speaking, the Speak. Be Heard. Be Considered. spoken word grand slam will bring 18 high performing poets, writers and rhymers to the Victoria Theatre stage on April 28 at 6:00 p.m., using poetry to make a difference. Winning performers will win a scholarship package to Sinclair Community College. This event supports the Community Initiative to Reduce Gun Violence (CIRGV) and the Community Police Council’s (CPC) efforts to speak out against gun violence and build better relationships between law enforcement and the young adult community.